Councils are forcing children into homelessness and destitution simply because of their parents’ migration status. For two years we have been investigating how Sheffield treats refugee families who have no recourse to public funds. 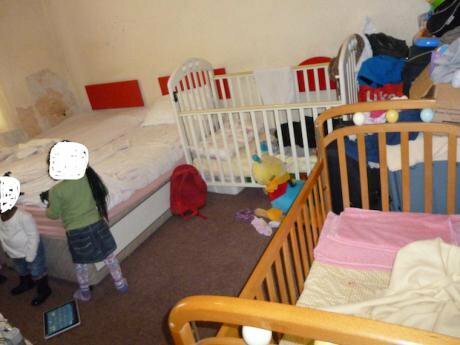 Our latest article exposes the dire state of temporary housing for mothers with young children, forced to share hostels with vulnerable homeless men. Here we provide some context to the situation. Across the UK councils are forcing children into homelessness and destitution simply because of the migration status of their parents. This problem is compounded by the housing crisis, which is hurting the poorest most. Sheffield City Council, the scene of our work, placed 43 homeless families with 97 children in bed and breakfast accommodation in the 11 months to 30 November 2017, according to an FOI we submitted. Some of them had been placed in B&Bs more than once, and some for many weeks. Of the 97 children, 40 were under five years old. In April 2016, we visited a mother and four children under five years (two year old twins, a three year old and a five year old). They’d been housed in the Alara Bed and Breakfast hotel in Hillsborough, Sheffield. The council had put them in the Alara, in one room on the first floor, nearly 18 months before. Amy’s social worker had told her that she and her children didn’t qualify for anything better because they have ‘No Recourse to Public Funds’ status, although three of Amy’s four children were British citizens. Amy told us: “We have breakfast which is OK, but then we have to go to food banks or get cheap takeaways. I cannot cook in here at all.” Amy hoped we might be able to get her moved. She had been frightened to complain to anyone but her social worker. “They told me I would have to make another claim to stay in the UK in October this year, and I don’t want to be deported,” she said. Amy showed us the damp and dirty walls near the beds she shared with her children. The rest of the place, carpets, toilets, showers are really nice and clean”. We protested to the council. Sheffield’s Children Young People & Families department (social services) told us that the council’s Private Housing Standards department “had recommended the Alara”. But after the standards department sent a two-person inspection team to the Alara, social services said: “We consider that the accommodation is not suitable for either family.” That was April. We advised Amy and her children not to move to different B&B accommodation, but to hold out for something suitable. The council offered a city centre “family room” in a budget hotel — again just one room. We maintained that the council should provide temporary housing suitable for Amy and her four children. Eventually, faced with potential legal action on the basis of the children’s human rights, the council agreed to offer Amy a standard council house on a temporary basis. Seventy per cent of Sheffield’s homeless people in temporary accommodation are single men or childless couples, that’s almost three times the national average of 26 per cent. Our investigations suggest that a small but growing number of homeless children in families in Sheffield have no recourse to public funds. This is a growing problem across the UK affecting families in cities like Manchester, Glasgow and Birmingham. In late 2015, Hackney Community Law Centre and Hackney Migrant Centre produced “A place to call home: a report into the standard of housing provided to children in need in London”. FOI requests revealed that six London local authorities supported 1,570 “Section 17” families or children between them during the last six months of 2014. We are campaigning to make sure in Sheffield, the UK’s first City of Sanctuary, the council defends the safety of refugee children, whatever their status. All names of refugees and refugee children, and interviewees, have been changed. Edited by Clare Sambrook & Rebecca Omonira-Oyekanmi for Shine A Light.